Every time I hear the phrase “Feasibility Study,” I cringe. A Feasibility Study means an organization isn’t thinking about their customers. They’re thinking about themselves. And that means the customer isn’t going to end up with their problems getting solved. Why do people do Feasibility Studies? Generally, to find out if it’s feasible to build something. Do they have the resources to build it? Do they have the technical ability to build it? Is it even possible to build? Whenever an organization starts with a Feasibility Study, it means they’re more concerned with can they build something, rather than should they build something. Which means they end up building something that’s feasible… but not necessarily desirable. Instead of starting with a Feasibility Study, start with a Desirability Study. Go find out what the customer truly wants. What is the most desirable way to solve their problem? Pretend you’re in an ideal, magical world with unlimited resources and no pesky physics. There’s nothing stopping you from making your customer’s wildest dreams a reality. Go find out what those wildest dreams are. Only move on once you know how desirable a solution is. At Wonful, we use a framework called DVF, or Desirability, Viability, Feasibility, to compare and prioritize product ideas. Whenever we’re evaluating a potential idea, we rate it on these three metrics, and in that order. To use a concrete example, lets talk about Jet Packs. Rate your idea a score of 1 (low) to 10 (high) for each of the three dimensions. These ratings are a best-guess, and Desirability is based on your understanding of the customer (and should be supported by customer interviews and fresh data). Jet packs would definitely rate a 10 on Desirability, probably an 8 on Viability (only rich people could afford them at first, but there’d definitely be cheaper models in the future), but definitely a 1 on Feasibility. If you have more than one product idea, you can also use DVF to decide which ones to focus on. Once all your ideas are rated, examine the ones that rated highly across the board. Start exploring those in more detail. 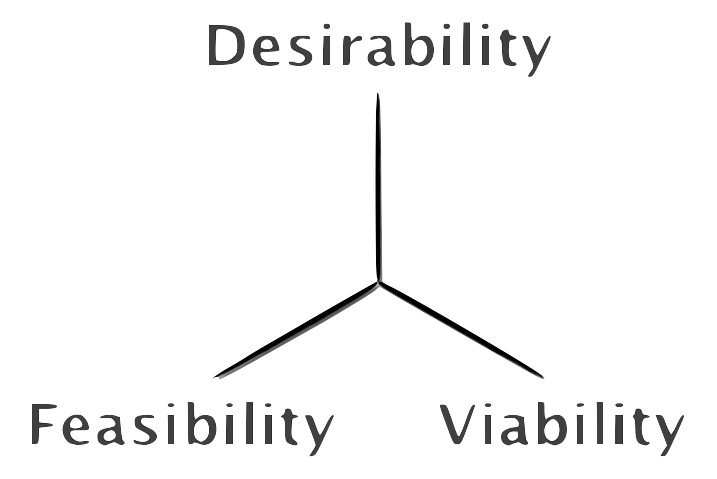 Then look at ideas that ranked high on Desirability, but lower on Viability or Feasibility. What can you change about those ideas to improve them? Instead of jet packs, we could make one of those water powered jet packs. Yes, it’d be for recreation instead of practical use, so the desirability would probably drop down to a 7. And yes, you’d be tied to a lake or a river instead of free to fly wherever you want, so make Viability a 6. But feasibility would shoot up to a 9. It’s totally something we could build! Add it to your list of ideas to continue exploring. Desirability is the most important of the three elements. If we didn’t start with Desirability, we never would have thought of the water-powered jet pack idea. If we had started with Feasibility, we would have simply ruled out jet packs as something that couldn’t be built and moved on. People start with Feasibility Studies to see if they can build something. But what’s the point in building something if nobody wants it? Start with Desirability Studies to figure out how desirable products are, use DVF to compare different product ideas to help you prioritize what to explore more, and worry about how realistic and feasible an idea is only after you know people would want it.